Let me just get right to the good stuff! These cookies are amazing! And found on Pinterest! Here’s where I got them! In a large bowl, cream butter, cream cheese and sugar until light and fluffy. Beat in egg yolk and almond extract. Combine the flour, baking powder and salt; gradually add to creamed mixture and mix well. Roll into 1-inch balls and roll in remaining coconut. 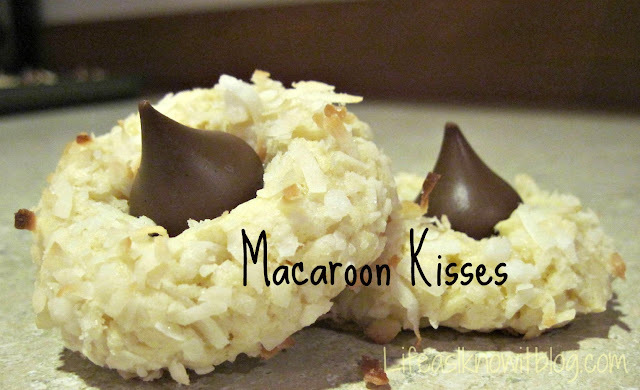 Immediately press a chocolate kiss into the center of each cookie. Sprinkle with coarse sugar. Cool on pan for 2-3 minutes or until chocolate is softened. It looks so cute and the preparing method is bit easy and I will make it for my Christmas eve table.